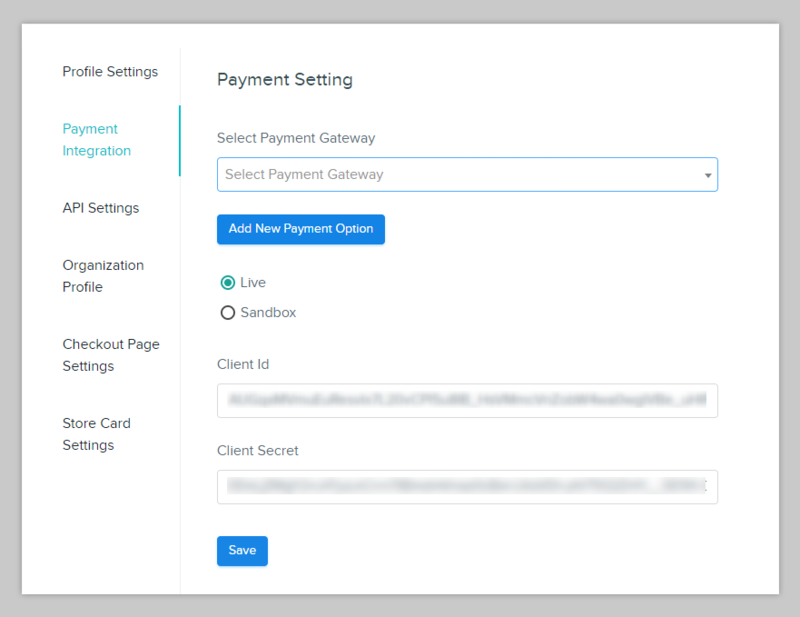 Once you have purchased the lifetime plan of Pabbly Subscriptions, you have to integrate a payment gateway, PayPal in this guide to facilitate payment collection. 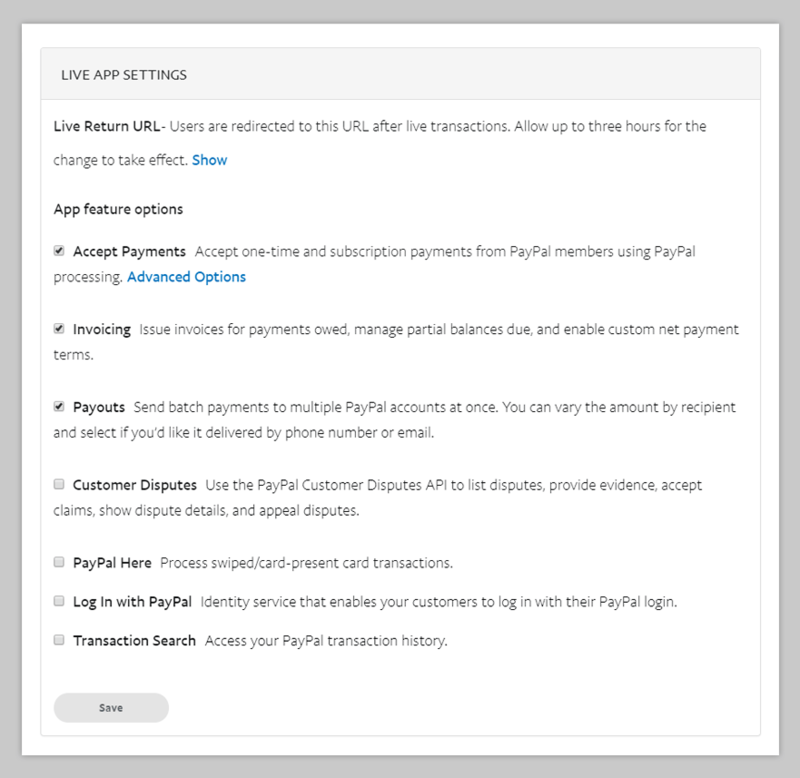 Follow the below-listed steps to integrate PayPal payment gateway in your Pabbly Subscriptions account. Note: If you want to learn about the complete working of Pabbly Subscriptions you can check the “How It Works” guide below. 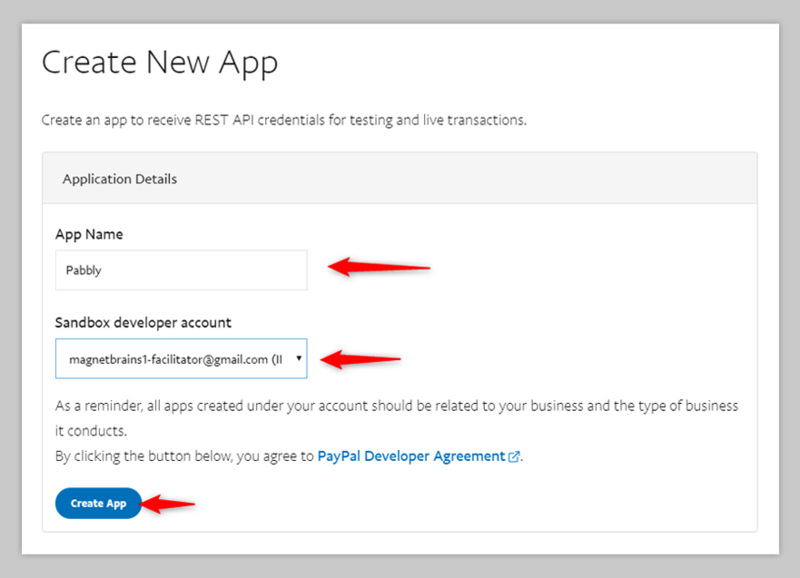 In order to integrate PayPal payment gateway in your Pabbly Subscriptions account, you have to log in to your PayPal account. Once you have logged-in your account, you have to manually change the URL to “https://developer.paypal.com/“. After this, you have to select the drop-down menu and click on My Account sub-menu. 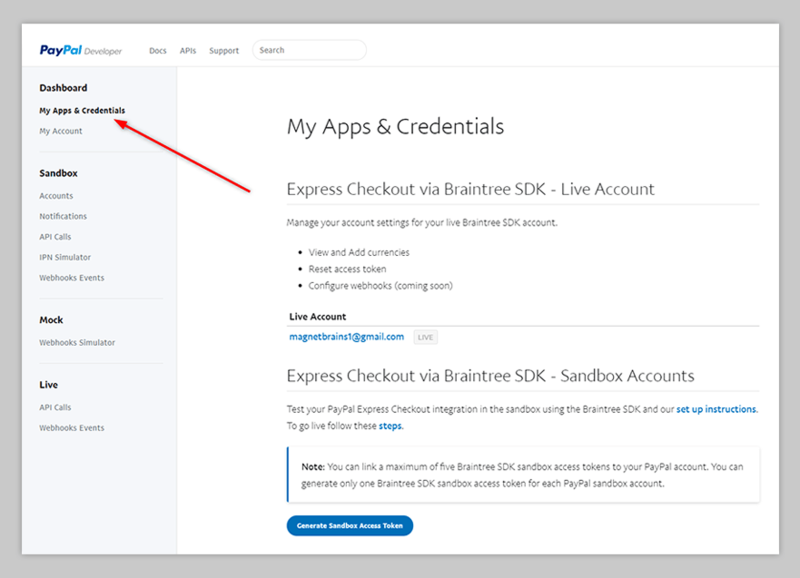 In the developer dashboard, click on “My Apps & Credentials” available in the left-sidebar. 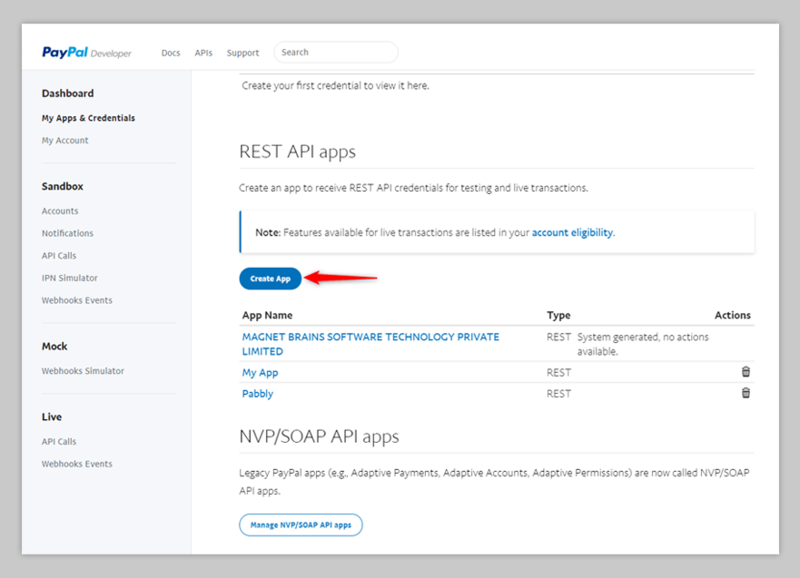 Once clicked, scroll down to the “REST API Apps” section and click on “Create App” button. Once you click on Create App button (in step 4), a pop-up will appear on your screen, in which you have to enter application details like App Name and Sandbox Developer Account. App Name should be the name of your application that you are creating. 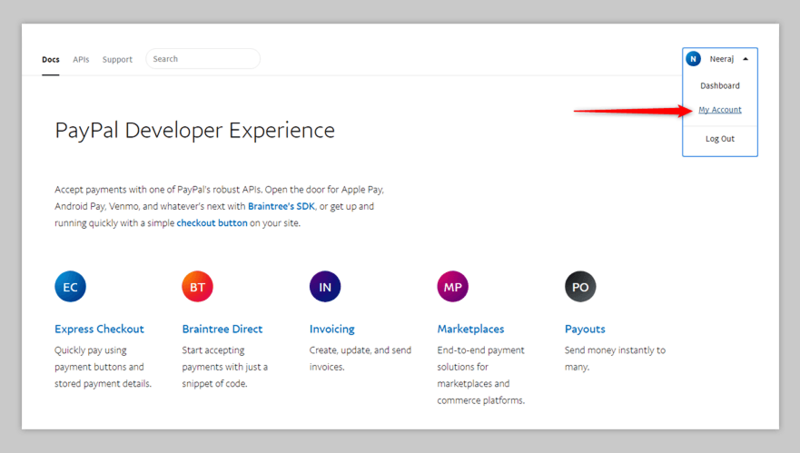 Sandbox Developer Account takes your PayPal sandbox email address. For example, If your PayPal email address is “mypaypal@gmail.com” then your Sandbox email address will be “mypaypal-facilitator@gmail.com“. Clearly, all you have to do is add “-facilitator” just before the “@” symbol. After this, click on “Create App” button. Once you have created your app by clicking the “Create App” button (from step 5), you are now required to generate Client ID & Secret ID for your app by first, click on the “Live” button. After this, your Client ID & Secret ID will be generated automatically. After this, Click on “Save”. 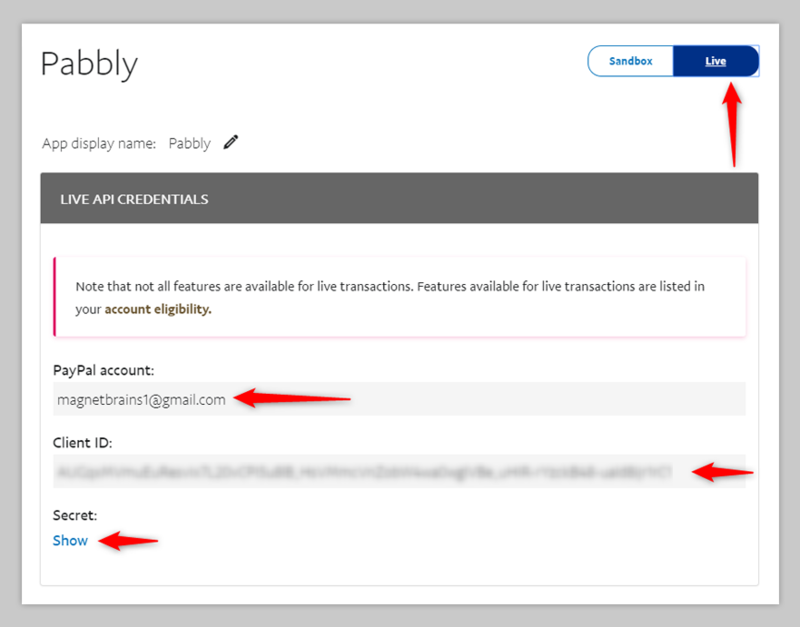 The last step involves the addition of Client ID & Secret ID in your Pabbly Subscriptions account. You are required to go to the Payment Integration settings and select the preferred Payment Gateway as PayPal from the drop-down list. After this, click on “Live “, add Client ID & Secret ID and then click on “Save“. Now, you are all set to collect payments via PayPal Payment Gateway. P.s: PayPal and Stripe payment gateway charge some amount as a ‘Transaction Fees’ on every transaction of your customer.